About Us - D/N Excavating Inc. : D/N Excavating Inc.
D/N Excavating serves the upstate New York counties of Albany, Columbia, Rensselaer, Saratoga and Schenectady in the areas of commercial and residential excavating. Started in January 2002, Scott Duso and Donald Nusbaum have combined over 40 years of experience in construction and excavating to provide personalized service for each an every project. Staffed by experienced and knowledgeable technicians, D/N Excavating is fully insured and specializes in DEC approved techniques for handling fragile fresh water wetlands and other environmental concerns such as erosion. Scott Duso began his career with a local construction company in 1988. Over the years he was educated in all aspects of the excavation industry. Donald Nusbaum also began his excavation career in 1988. 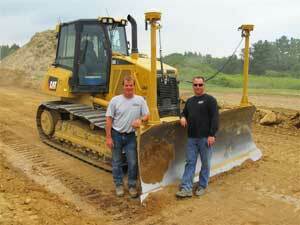 He and Scott worked side-by-side for many years learning the business of commercial and residential excavation. Together Scott and Donny soon realized the need to form a company which was built on the concept of personalized service to their clients. Few excavating companies offer direct contact with the company owners for each of their projects on the level that D/N Excavating does. Give Scott or Donny a call today!